Born on January 19, 1958 in Sacramento, California, Thomas Kinkade is one of the most widely known American artists of our time. Best known for his picturesque depictions of nature in its most beautiful forms in addition to other spectacular outdoor scenes, Thomas Kinkade is admired around the globe for his stunning ability to capture light and bring it to life on his canvases. Thomas Kinkade comes from an extremely modest and humble background. Growing up in the small California town of Placerville, Thomas Kinkade began to truly notice and appreciate the world around him as a young boy. It was also during this time that Kinkade's inherent moral values and strong sense of family were cultivated. As a devout Christian, Kinkade used his works of art as an inspirational means of perpetuating those deep-seated values and beliefs. Thomas Kinkade's appreciation for art began at a very young age, by simply sketching images of the things around him. In his college years, after spending a summer on a sketching tour that led to the publishing of the best-selling book The Artist's Guide to Sketching, Kinkade was asked to help create art for the animated film Fire and Ice. It was during this period that Thomas Kinkade began to truly discover and explore his extraordinary talent. Soon after, he started selling his original pieces in art galleries throughout the state of California. 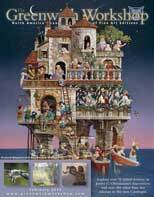 Shortly following his 1982 marriage to childhood sweetheart, Nanette, the pair officially began to publish Kinkade�s work. Having traveled all over the world, Thomas Kinkade has produced striking images of some of the most beautiful places on earth. From quaint tree-lined streets and blossoming gardens to snow-covered lakeside cabins and breath-taking mountain vistas, Thomas Kinkade has a way of capturing the peacefulness and serenity of the world like no one else can�with a warm glowing light seemingly inviting you in to forget the stresses of everyday life and experience this incredible paradise for yourself. Thomas Kinkade was the recipient of countless awards throughout his illustrious career, including several National Association of Limited Edition Dealers (NALED) awards for Artist of the Year, among numerous others. In 2004, Thomas Kinkade received a highly distinguished award from NALED, recognizing him as the most award-winning artist of the past quarter century. He also had the honor of working with Disney to recreate some of their most cherished movies on canvas. On April 6, 2012, Thomas Kinkade passed away unexpectedly at the young age of 54. He is survived by his wife Nanette and their four daughters. His legacy continues to live on through is artwork.